As you stare at this computer screen, I’m most likely enjoying a piece of homemade and oh-so-deliciously fresh, peach pie with crumble topping. Yes, hot out of the oven with a scoop of ice cream melting down the edges, it’s a little piece of culinary heaven and the wonderful news is that you can enjoy this shortly too. 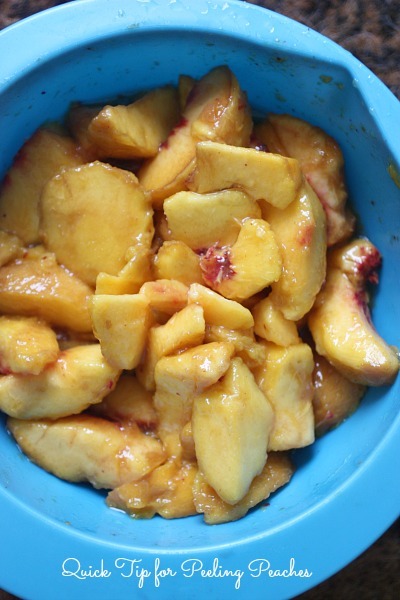 I’ve already shared my quick and easy kitchen tip for peeling whole peaches in minutes and since I recommend tripling this recipe and making three whole pies at the same time, this is a tip that will make the hardest chore (peeling) relatively painless. As you read the directions, I mention placing foil or ziplock bag over pie tin before filling. Honestly, at first I wanted double the protection by using the tin foil, wrapping it in that and then sealing it in ziplock, but it’s completely up to you. I think it depends how long you plan on keeping these in the freezer. For us, this filling didn’t last long as we cobbled up both pie and cobbler within the week. Ok, full confession, half of this recipe never made it to the freezer. We just gobbled a whole pie on demand. 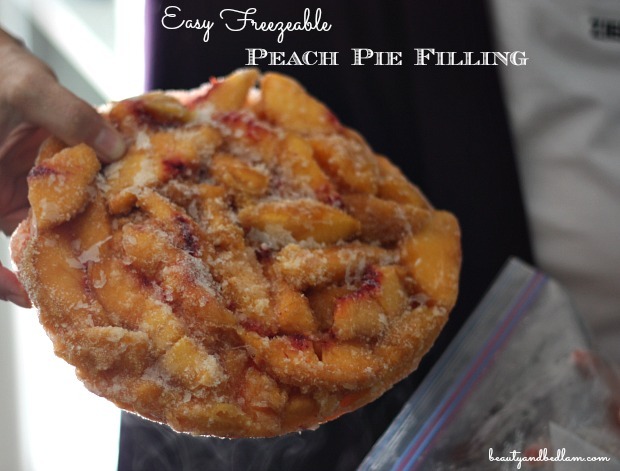 As you can see in the picture below, I laid the ziplock bag right on the pie pan and then scooped the peach filling carefully inside. Yes, I killed two birds with one stone and it was one of my more organizationally efficient moves, which doesn’t happen too often. Make sure you overfill the pans a bit. When you bake the pie, the fruit will cook down. I kept filling the ziplock pan after this picture. 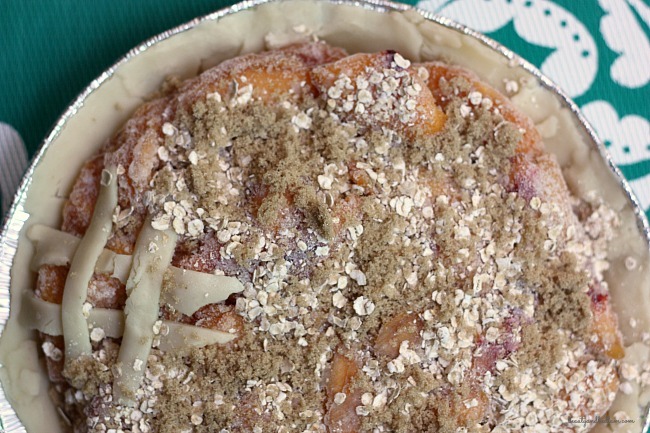 Yes, this is just about the coolest and easiest thing ever to have Fresh Peach Pie ready at a moments notice. You can see the amount of condensation caused by freezing in just the ziplock. This one was in the freezer for approximately three weeks, so you can determine how you want to do it from that picture. And this is where you know I became a bit lazy in the process. Isn’t it wonderful that my family still sang my praises even though I was 3 seconds into doing a pretty criss crossed dough topping, got lazy and just sprinkled some crumble topping on it instead? 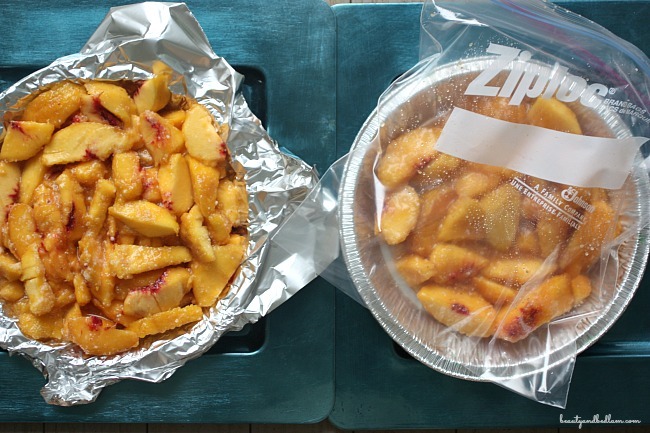 Now snag some peaches before the prices go up, and prep and peel them for your freezer in minutes. You will be thanking me in December. 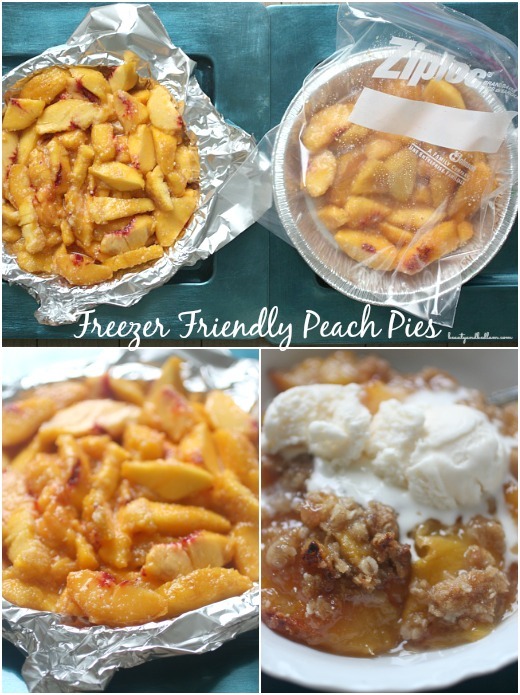 Summary: This delicious fresh Peach Pie Recipe is perfect for freezing. 7 large, firm ripe peaches, peeled, halved, seeded and sliced. 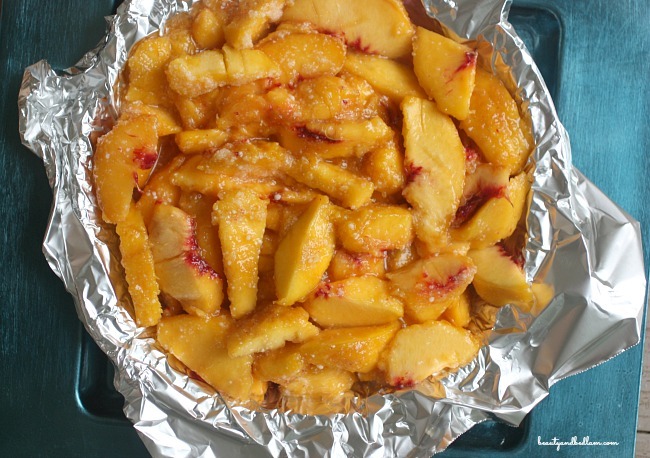 After peeling and slicing, sprinkle fresh fruit on peaches and stir. Then combine, peaches, sugar, tapioca, lemon rind or juice and cinnamon in bowl; mix well. Meanwhile, lay freezer paper, foil or ziplock bag (see post) over 9 inch pie pans. Loosely cover and place in freezer until frozen. 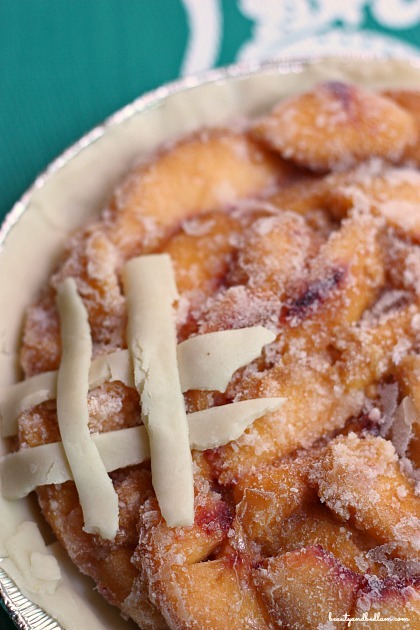 When frozen, remove from pie pans, cover and seal well so as to avoid freezer burn. When ready to use, remove from freezer and place in unbaked pie crust. Cover pie filling with additional crust or crumb topping. Bake at 400 degrees for 40 minutes, covered. 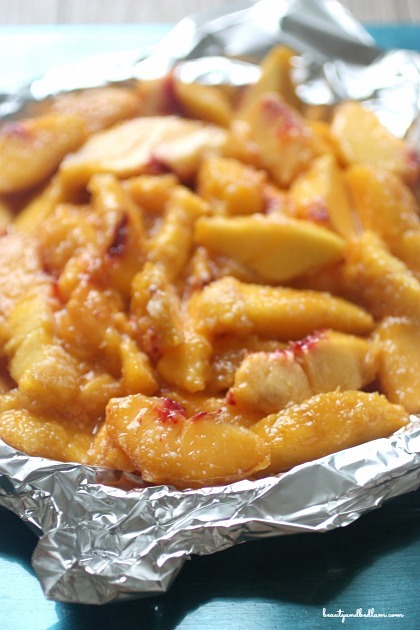 Remove foil and bake additional 15 – 20 minutes or until filling bubbles up and pasty is golden.